Three children, not older than five years, are languishing in cold and muddy camps for the displaced in Syria's northeast, far away from their family in France. They are the sons of Julie Maninchedda, a suspected French female jihadist who was killed in shelling on a former Islamic State group stronghold five months ago, and a captured German. Now, the grandparents they have never met are trying to get them back to France, imploring President Emmanuel Macron to show "humanity" and accept the children immediately. Behind a fence, one-year-old Suleiman looks around the Kurdish-run Al-Hol camp, where tens of thousands of people displaced by the fight against IS live alongside relatives of suspected jihadists. The baby's face is marked with scars caused by shelling. The infant is being looked after by a South African woman who once lived in the jihadist proto-state. He is one of nearly 40 children living without their parents in informal settlements in Syria's northeast. According to Save the Children, more than 2,500 foreign children from over 30 nationalities are living in Kurdish-run camps. Nearly half of them fled ongoing battles against the jihadist group in eastern Syria. Maninchedda was killed along with her second husband, a Moroccan IS fighter, in October when shelling hit the village of Al-Shaafa in eastern Syria, two women who were in the area during the attack told AFP. At the time of her death, she had been separated for several months from her first husband and the father of the three boys, Martin Lemke, a German jihadist who traveled with her to Syria in 2014. His departure led to the separation of their three sons Suleiman, Shahir, three, and Hassan, five. 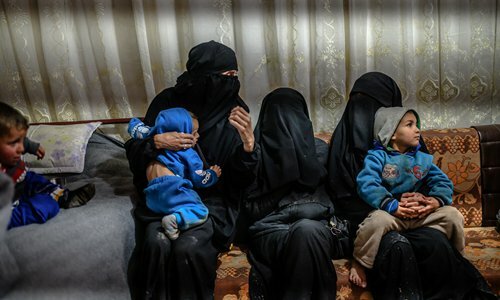 In late January, Lemke, his wives, and their children, surrendered to Kurdish-led forces after fleeing the village of Baghouz, the last IS redoubt in Syria. Suspected of having worked with IS intelligence, Lemke, was sent to a Kurdish-run detention center after handing himself over to US-backed forces. AFP met Lemke's wives and children at an SDF screening point outside the village of Baghouz this month. "It was too much, I already had my two little children with me," said Lemke's youngest wife, Leonora. The Syrian woman brought the two children with her to the Al-Hol camp. Nadim Houry, of Human Rights Watch (HRW), met Suleiman and Shahir in Al-Hol early this month. He said they were physically abused by the Syrian woman. Hassan has landed in another camp in the northeast, the South African who takes care of his little brother, told AFP. More than 4,000 kilometers away, in northern France, Lydie Maninchedda, 56, learned last month that her only daughter, Julie, had died in Syria. Along with her husband Patrice, she wrote to Macron to ask him to "show a little humanity" by sending the grandchildren to France. "God knows what they have lived," she told AFP. "But they are very small, they have not done anything, we have to give them a chance to rebuild themselves, to have a life." Lydie Maninchedda is also campaigning for adults to come home. "It takes lawsuits in France to have answers," she says. "Why did 1,700 French people go there? I do not know why France does not want to answer this question."